As a writer in the Technical Writing domain, one of the major rules that you look for is writing in Active voice. This fact is drilled down to the core of every Technical Writer. Of course there are instances where Passive voice is a must (test yourself by asking this! ), but over all the voice has to be active since the words should help the user to perform certain actions. There are several tools that you generally would like to use to check for passive voice. Relying on editors is one of them! But if you want to check it before it goes to the editor's desk and avoid the rebuke, simple tools that Microsoft® Word offers can help. 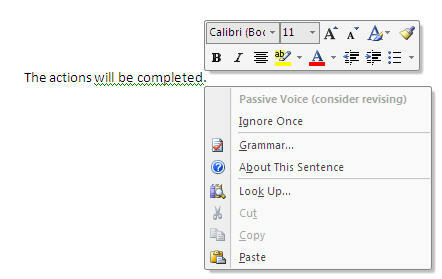 You just need to activate the Style checker in Word, and it will do the work for you. Open Microsoft Word and click on the Office Button. In the Word Options window, click on Proofing. In the When correcting spelling and grammar area, click on Settings. 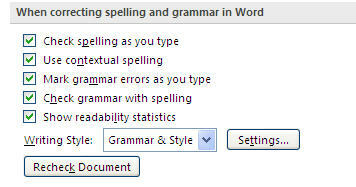 In the Grammar Settings window look for the Writing Style field and select Grammar & Style. Click OK to save the settings. PS: A lot of you might be using this already, but am sure there are a lot of folks who want a simple tool to check for passive voice. Why not use Microsoft Word for starters? Lost in the past, castes and sentiments?